Copy and paste the code above, to embed the infographics in your website. Contrary to popular notion, malnutrition is not only the deficiency but also the imbalance of nutrition in body, which causes various ailments. Intake of a balanced diet is therefore key to wellbeing. A simple rule to ensure this is to follow a diet that includes 59 different varieties of items, apart from salt and indigenous spices. 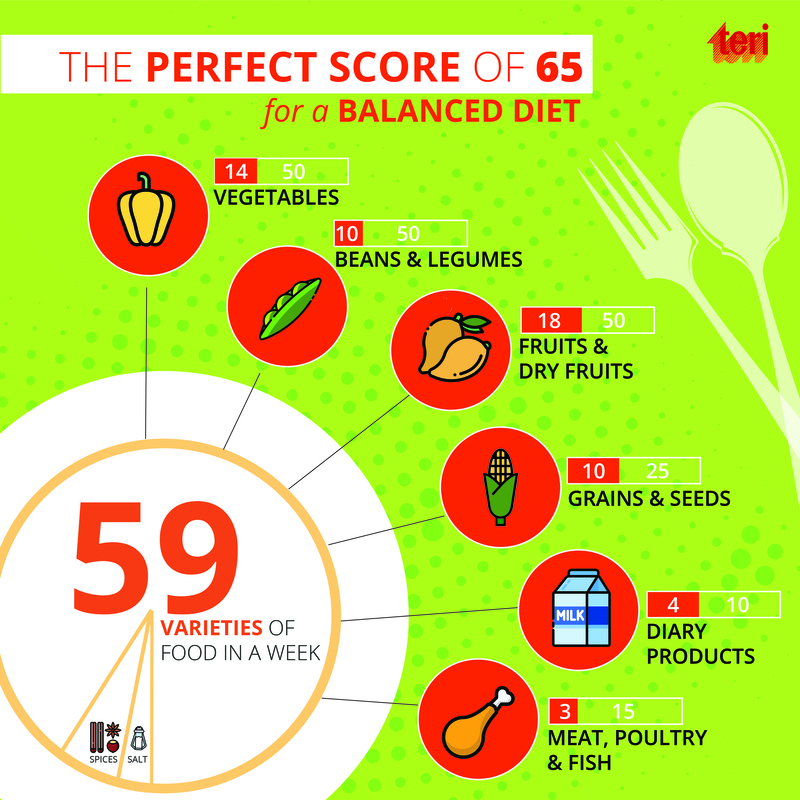 A total of 65 different food items, including, fruits, vegetables and grains, in a week will provide us with a wide range of micronutrients that otherwise get ignored in our regular diet. These micronutrients are essential for maintaining the health of various body systems. Local tribal communities in various regions of India rely on their indigenous plant growth for food as well as other purposes, which tend to be rich in the variety of micronutrients they provide. Traditionally, the variety they consume includes rich tubers, fruits, leaves and even some other precious tree barks. Compared to the usual food platter of an average urban household, this is far more nutritious. However, despite the rich biodiversity of certain areas such as Palghar, the local communities here have moved away from their traditional food habits, which have hampered their general health conditions, especially of women and children. Efforts have been made by TERI to re-acquaint them to the richness of vegetation around them so that they are able to create self-sustaining food systems. For general access to the knowledge of biodiversity hotspot in coastal Western Ghats of Maharashtra, TERI has created an exhaustive repository of all the indigenously grown species of wild edibles.